This is a package of an entrance ticket to Robot Restaurant and all-you-can-eat sushi dinner at Hinazushi Restaurant in Shinjuku. The robot cabaret show at the Robot Restaurant has become of the most trendy thing-to-do in Tokyo now. A fusion of Japanese culture and robots and an one-of-the-kind sensation that you have never seen before. 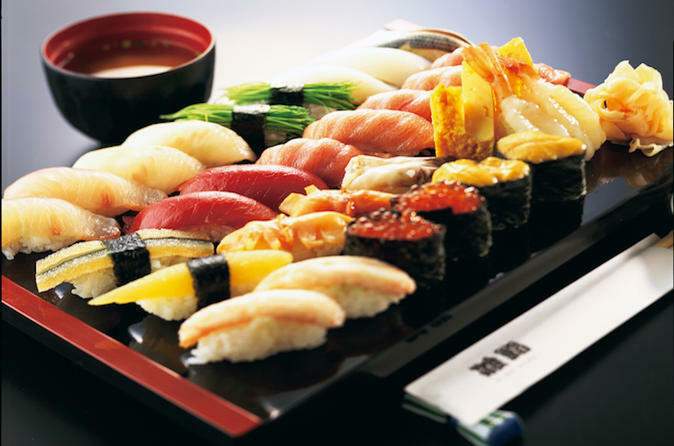 The all-you-can-eat sushi will be served at Hinazushi Restaurant featuring over 60 kinds of sushi. What's even better is the optional "all-you-can-drink" package. All-you-can-drink menu includes beer, sake, shochu, lemon sour, whiskey soda, wine (white/red), plum wine, non-alcoholic drinks (coke, oolong tea, orange juice). If you'd like to include all-you-can-drink option, please select Dinner B option at checkout.